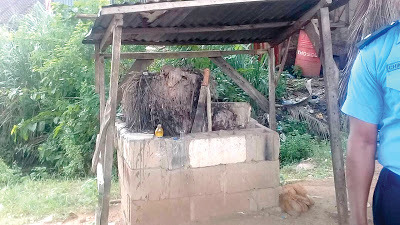 A shrine allegedly used as an illegal detention camp by suspected members of Odua People’s Congress, OPC, in Opebi area of Lagos, where persons accused of different offences are arrested, tortured and detained, has been uncovered by the Police. Three suspected operators of the shrine were arrested with a POS machine used to extort anyone found guilty. Also recovered in the shrine were different banks Automated Teller Machine, ATM, cards and telephones suspected to have been seized from victims. Vanguard gathered that people visited the shrine to lodge complaints, after which the accused is either invited or forcefully dragged there. Victims, according to residents, were publicly tortured before being dragged inside the shrine to swear. The state Commissioner of Police, Imohimi Edgal, who led a team of policemen to the shrine yesterday, ordered its immediate demolition. He explained that Lagos State Neighbourhood Security and Safety Corps, LSNSC, informed the Command of some suspicious movement of persons in and out of the shrine, consequent upon which he directed the Divisional Police Officer in charge of Ikeja to ascertain what was going on there. Addressing journalists at the scene, Edgal said: “A team of undercover policemen, led by the DPO, mounted surveillance around the area.